This stunning black beauty of Nokia 8600 is a slider made of stainless steel, giving the handset an extremely sophisticated look and feel. 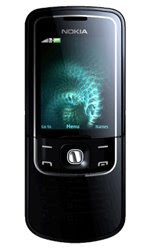 The display of Nokia 8600 having a high resolution of 240 x 320 pixels and 16 million colours is much better than even its more expensive counterparts. The music player and the FM radio keep up the entertainment quotient in this handset on a higher side. The 2 megapixel camera that clicks good quality snaps and records videos as well is a photographer’s delight. The internal memory of 128 Mbytes is sufficient enough to store up to 30 of your favourite songs that you can listen to even while on the go. Bluetooth and USB support makes for the connectivity options in the Nokia 8600. It is handset that beautifully blends good looks and advanced features in an extremely enticing package.